Facebook, Instagram, and Snapchat are some of the largest social media platforms in the world. But when it comes to online shoppers, they’re no match to Pinterest. 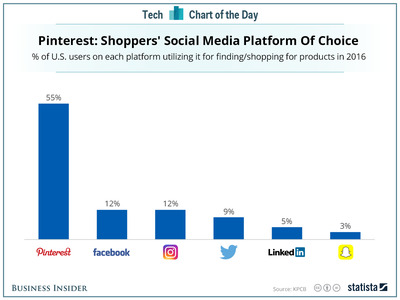 According to data from Kleiner Perkins’ 2016 Internet Trends report, charted for us by Statista, Pinterest was the most popular social media platform among online shoppers, with 55% of US internet users picking it as their top choice. Facebook, Instagram, and Twitter all lagged way behind, with Snapchat only drawing 3% of the responses. The report pointed out that Pinterest works well for shopping and finding products because of its image-based design. According to the report, 55% of US internet users indicated their primary use of Pinterest is for finding/shopping for products.